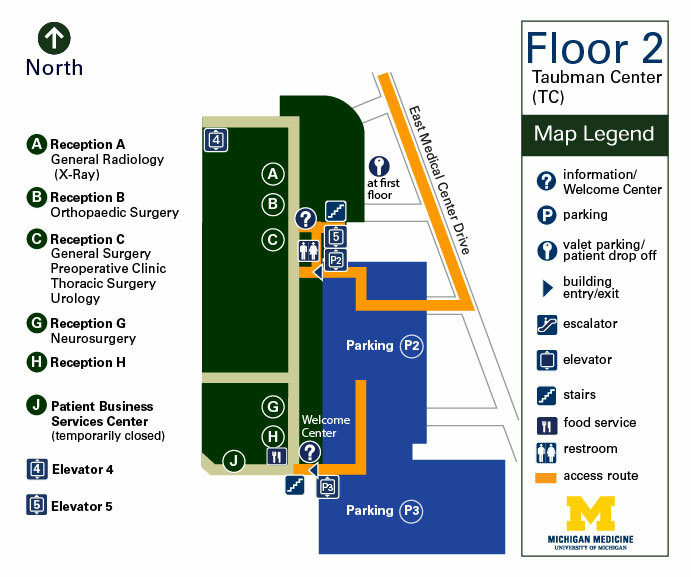 Parking for Floor 2 of the A. Alfred Taubman Health Care Center is in Parking Structure P2. Remember the level on which you parked. Bring your parking coupon with you to your appointment to be validated at the clerical stations for a reduced rate. Locate the parking structure elevator. Look at your appointment notice for the floor and reception location of your appointment. For clinics on Floor 2, take the parking structure elevator to Floor 2. Exit the elevator, enter the Taubman Center and turn right. Follow the signage on the wall and overhead to the Registration/ Information desk, where you will receive your "blue hospital card" or you may update your registration information. *Detailed directions to services located on Floor 2 of the Taubman Center are listed below. Look for signage to assist you in finding your location. Continue past the Information/Registration desk and on your left will be the Taubman Clinics. Reception A is located behind the Information/Registration area and down the hallway to your right. Continue past the Information/Registration desk and on your left will be the Taubman Clinics. Reception B is just behind the Information/Registration area. Continue past the Information/Registration desk and on your left will be the Taubman Clinics. Reception C is located behind the Information/Registration area. Continue past the Information/Registration desk and on your left will be the Taubman Clinics. Reception G is located behind the Information/Registration area and down the hallway to your left. Continue past the Information/Registration desk and on your left will be the Taubman Clinics. Reception H is located behind the Information/Registration area and down the hallway to your left.